The form of each asana reflects its function and vice versa. 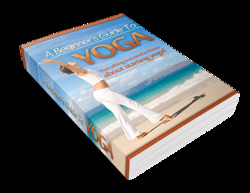 Here we use virabhadrasana II to analyze the positions of the body in a yoga posture. 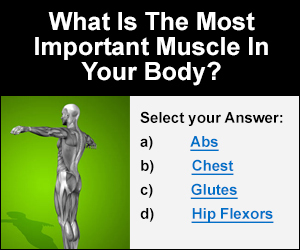 You can combine this analysis with knowledge of the muscle actions to optimize the function of your poses. 1. The front knee flexes. 2. The front hip flexes. 3. The back hip extends. 4. The back foot rotates internally. 7. The forearms rotate internally. 8. The neck and head rotate. 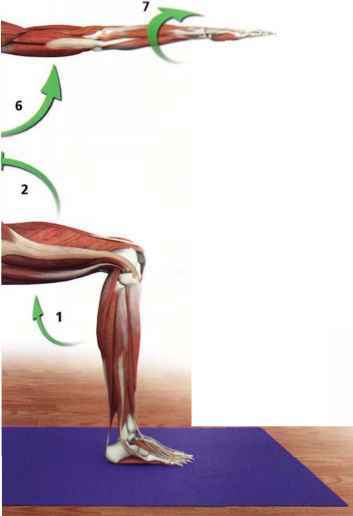 Movement of adjacent joints in different planes is called coupled movement. 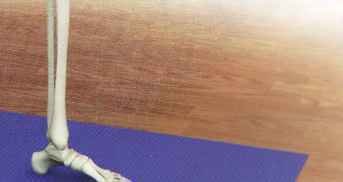 For example, in the side bend of utthita trikonasana, the vertebral column undergoes a complex series of coupled movements, including rotation, flexion, and extension at various levels. Similarly, in the same pose, the position of the hip joint of the forward leg involves a combination of flexion of the femur (thigh bone) at the hip joint and forward tilt of the pelvis. In reality, and especially in yoga postures, movement can rarely be described in simple terms. Complex movements involve many joints moving in various ways. Complex movements are also described in terms of other characteristics, including coupling of joints and open and closed chain movements. 1) Open chain: Movements in which the distal end moves freely are called open-chain movements (for example, the deltoid abducting the upper arms in virabhadrasana II). 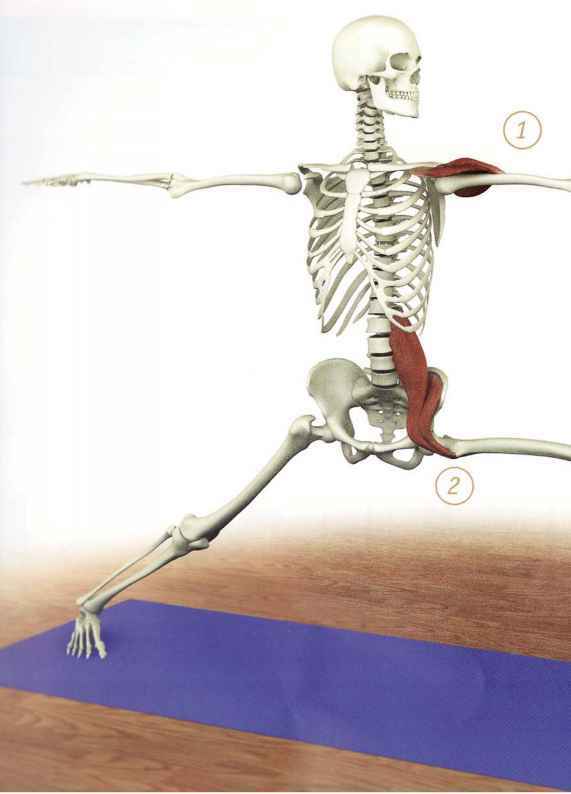 2) Closed chain: Movements in which the distal end (the insertion) of the moving limb or body segment are fixed are called closed-chain movements (for example, the iliopsoas lowering the pelvis in virabhadrasana II). Open chain movements teach balance and awareness of t he body in space. Closed chain movements strengthen the core muscles.